A fourth component of our work is concerned with human performance by measuring their movements in specially design behavioral tasks, and also by measuring their brain activities with neuroimaging techniques. 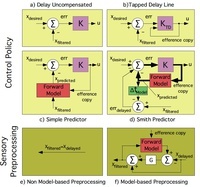 Such research connects closely to work in Computational Neuroscience for motor control, and it includes abstract functional models of how brains may organize sensorimotor coordination. Finally, a large part of the research in lab emphasizes studies with actual humanoid and biologically inspired robots. 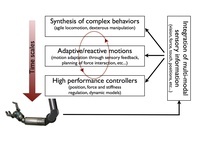 With this work, we are first interested in testing our learning and control theories with real physical systems in order to evaluate the robustness of our research results. Another challenge arises due to the scalability of our methods towards complex robot: our most advanced robot requires the nonlinear control of over 50 physical degrees of freedom that need to be coordinated with visual, tactile, and acoustic perception. When attempting to synthesize behavior with such a machine, the shortcomings of state-of-the-art learning and control theories can be discovered and addressed in subsequent research. Finally, we also use humanoid robots for direct comparisons in behavioral experiments in which the robot is treated like a regular human subject. Please see below for more information on the current research areas and projects at the Autonomous Motion Department.